The web has been abuzz recently with news of Andromeda. We are talking about the new Andromeda OS that is still largely shrouded in mystery, just like its galactic namesake. But here is a look at some of the things you might find in the Andromeda OS and the features that it could possibly have when it is finally launched towards the end of this year. It has been a long time that Andromeda has been the subject matter of rumors. Two big sources of these rumors are 9to5Google as well as the Android Police, who are generally known to have rock solid sources and all the reliable gossip. The rumors further gained force when Hiroshi Lockheimer, the current Google Chrome and Android chief, sent a cryptic tweet on 25th September 2016 recalling the first Android version that was announced exactly eight years ago on the same day. He also pointed out that eight years from now, we will most likely be talking about Oct 4, 2016. That is the date set for the Made in Google showcase, which has led to all kinds of speculations about the new "Android". 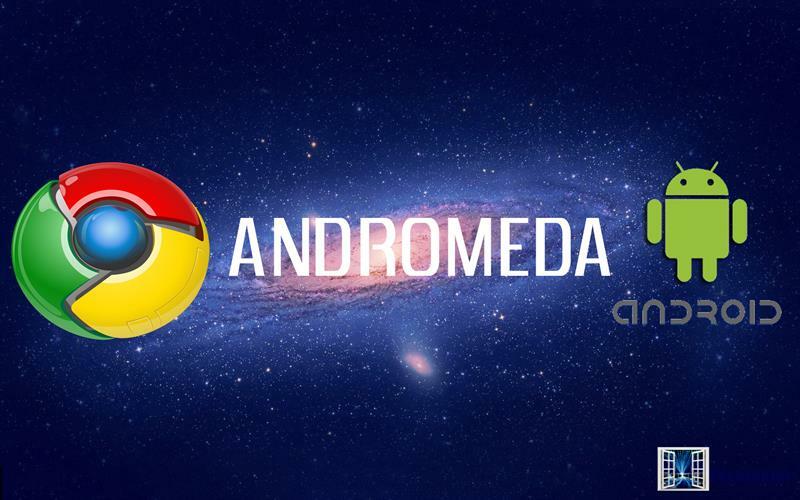 What we know about Andromeda is that it is going to be an Android and Chrome hybrid operating system. This is evident from the naming: Android + Chrome = Andromeda. It will be good news for many, who do not already know, that Google has plans to scrap the Chrome OS that you would find on Chromebooks. Chrome OS was never able to gain a strong foothold in the netbook market because other netbook OSes like Linux and Windows 7 already support native applications besides a web browser. The new hybrid OS is named after the galaxy and planned for a number of devices that Google plans to launch in 2017. There is a high chance it will be included in the upcoming Pixel 3 laptop that is derived from the Chromebook Pixel but will very likely run Andromeda instead of Chrome. If we are to go by the naming of the operating system, Andromeda seems to stress on its Android roots. With the announcement of killing Chrome last year, Google had also said that it would merge the best features of Chrome with Android to create a hybrid OS. It could be reasonable to assume then that Andromeda is going to have greater elements of Android in it. Note that this operating system has nothing to do with Google's earlier announcement that it is going to bring Android apps to Chromebook. We might get an early glimpse of the OS at the Made by Google event that is going live on October 4. It is also expected that Andromeda OS will have an open-source philosophy like Chrome did. While there is no confirmation or conclusive proof, the grapevine9to5Google has it that Google is going to put the Andromeda in the Huawei Nexus tablet soon to be released. Even before the Pixel laptop sees the light of day, a 7 inch Nexus 7 or something similar that may be branded as the Pixel 7 may carry the Andromeda. What is the basis for such speculation? There have been rumors recently that Huawei is working with Google on a Nexus phone. This device is rumored to have a Qualcomm Snapdragon 820 processor and 4GB RAM. One interesting bit of speculation that has accompanied these rumors is that Andromeda may be able to run on devices that are capable of running Android. It also appears that Google is testing Andromeda on the Nexus 9. The Surface Composition Test, which is a low-level graphics performance test, seems to already have been carried out with Andromeda. Sources say that devices running Andromeda will need performance scores of at least 8. There have also been some suggestions that Andromeda may come as a developer preview version with the Huawei tablet that will otherwise come with Android out-of-the-box. Clearly, there are varying accounts from different sources and it is early days to come to a conclusion about the mobile device to expect. One of the big questions regarding Andromeda will be this: what can Android possibly gain from Chrome? Android already has taken many features from Chrome OS and included into the Nougat Upgrade. This upgrade used Chrome's seamless way of bringing in software updates. What else could Andromeda take from Chrome? Now this is purely hypothetical since there is not much to go on. But maybe Andromeda could have a dual approach, one that combines Android's touch-centric environment with a Chrome OS environment when a keyboard is present (maybe in the form of a Bluetooth keyboard and a Chromecast). This could be a seamless way of combining the two operating systems into one device, whether it is a Pixel 3 laptop or a Nexus tablet. The results could be powerful, with mobiles gaining great productivity. Hiroshi Lockheimer said on this podcast interview that in the future Google hopes to keep the best of both operating systems without forcing either of them to go away. It is also strange that the Chromebook Pixel was discontinued within two years without a replacement being announced. This means that some big changes may be happening at Google, and Andromeda may have something to do with it. At the same time, the Pixel C convertible Android tablet clearly wasn't meant to run Android, but it seems it was originally a Chrome OS device. All these evidence seem to point towards a merge of Chrome's desktop-style capabilities and Android's touch-centric strong points. Maybe Google is trying to create a convertible super-device with the best of both worlds. Now that will be something worth looking forward to.